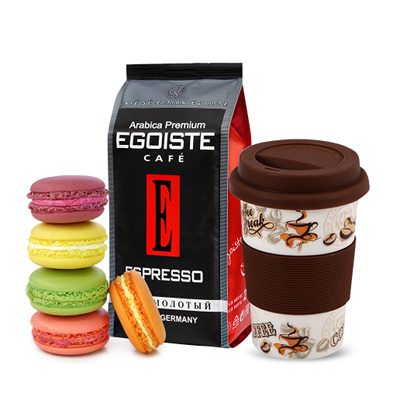 Make your lady’s morning enjoyable, full of energy and sweetness with this wonderful coffee set! 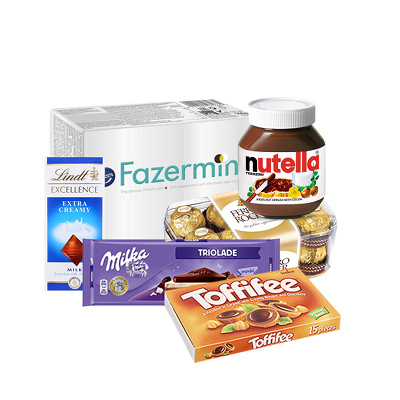 Every lady loves sweets, which is why chocolates are a wonderful gift to send at any occasion. The collection of excellent chocolates with various tastes will bring a lot of joy and pleasure to her! If you can’t decide whether to send your lady flowers, candies or perfume, why not combine all three by sending her this unique gift set. Tantalize her taste buds with the delicious Raffaello candies. Sensualize her sense of smell with the Puma yellow perfume. Show your eternal love with white roses. Are you looking for romance? There is nothing quite as romantic as snuggling down with your loved one, enjoying a mouth-watering box of Ferrero Rocher chocolates and being surrounded by red roses. 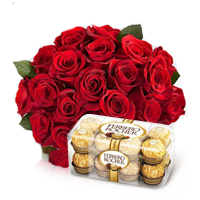 Rouse romance with this gift set of red roses and Ferrero Rocher candies. 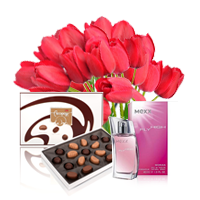 Chocolates, tulips and perfume… Could there be a more romantic combination? We don’t think so and neither will your lady. Appeal to her heart with the tulips. Charm her taste buds with the box of assorted chocolate candies and make her feel desirable with the Mexx Fly High Perfume. Who could not resist smiling and feeling loved when they open up a gift set comprising of red roses and a teddy bear? 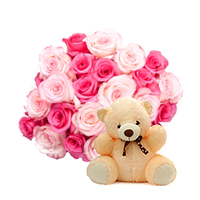 Sending more than two dozen red roses accompanied with an adorable cuddly teddy. bear will be a thoughtful, idyllic and loving way to express your feelings to your loved one. Why send a solitary rose when you can send your lady roses, a teddy bear and Tobleron chocolate? Convey your eternal love to your loved one by appealing to her most poignant senses – touch through the softness of the teddy, taste through delicious Tobleron and smell through delicate roses. If you are looking for a glamorous, exquisite and sophisticated gift set that tenderly denotes your ceaseless love, then opt for this utterly classy gift set. 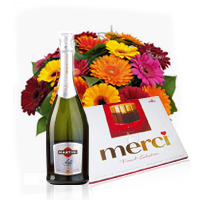 This stylish gift set tastefully combines an exquisite bottle of Champagne, some Merci chocolate to drool over and dainty gerberas to gaze at lovingly. Red roses are a timeless gift and symbol of love that stirs a sense of commitment and appreciation. Chocolates have a similar romance-inducing effect. So why not rouse feelings of love and desire and send the love in your life pretty red roses accompanied with a heart-shaped box of chocolate candies? Does the love in your life struggle with the English language? Is communicating with her fairly difficult? If so, why not give your beloved a thoughtful and practical gift by giving her some private English lessons? Following these English lessons communication will be easier and your relationship even more fulfilling.